Twice a year, the Israeli singer Ilanit participates in what she and three other Israeli celebrities call the Rivka Club. The club is named for Rivka, a Haifa resident who is a huge fan of Ilanit, songwriter Nurit Hirsh, and actresses Rivka Michaeli and Gila Almagor. Rivka arranges biannual breakfasts with her four favorite entertainers at one of their homes. “Gila Almagor is busy, Rivka Michaeli is busy, Nurit is busy - this fan is the only one who is able to bring all four of us together twice a year to see each other,” Ilanit told Ynetnews. Of course, as a leading musician, Ilanit is also very busy. In June, one month after Ynet readers voted her one of the most beautiful Israeli women of all time, Ilanit traveled to North America with four other singers - Yardena Arazi, Ruthie Navon, Shlomit Aharon, and Margalit Tsanani - to perform at the Jewish National Fund of Canada’s annual Negev Gala in Winnipeg, Manitoba. She also held a concert at the University of Judaism in Los Angeles in April. Ilanit has released many successful albums in Israel and Europe and her hits include Eretz Eretz, Bashana Haba’ah, Kvar Acharei Chatzot, Ahavata Shel Tereza Dimon, and Shir Al Nechalim. She was named Israel’s top female singer every year from 1971-1977 and has represented the Jewish state in song festivals and competitions from Brazil to Greece to Japan. In 2005, she celebrated a milestone - 40 years of performing - and was honored by her peers with a special tribute concert. She began her career as part of the 1960s singing duo Ilan and Ilanit. Ilan, whose real name is Shlomo Zach, now manages the careers of Ilanit and many other singers, and prefers to concentrate on the business side of the music industry. In 1973, Ilanit made history by performing Israel’s first Eurovision Song Contest entry, Ey Sham (Somewhere), in Luxembourg. The song, composed by Hirsh, placed fourth, and for the next 20 years, held a Eurovision record as the highest debut for a competing country. However, Ilanit feels Ey Sham could have placed higher. Despite that disagreement, Ilanit and Hirsh continued working together and remain close friends. 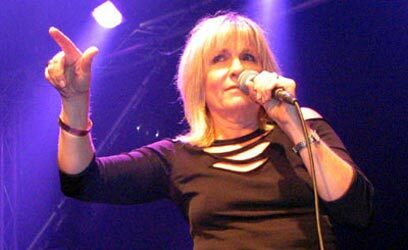 Ilanit represented Israel again at Eurovision in 1977 in London, where she performed Ahava Hi Shir Lishnayim (Love is a song for two), which placed eleventh. She was supposed to represent Israel a third time in 1984 with Balalaika, but the Israel Broadcasting Authority withdrew the entry when that year’s Eurovision organizers scheduled the competition on the Remembrance Day. Although she is firmly rooted in Israel, Ilanit - born Hanna Drezner in Tel Aviv in 1947 - spent most of her childhood halfway around the world - in Brazil. Ilanit’s parents left Poland in 1939 and arrived in Palestine aboard a ship that eluded the British authorities, who severely restricted Jewish immigration. Her parents came at the request of her paternal grandfather, who immigrated in 1932 and wanted his children to join him. Ilanit’s father and four of his siblings did so, but the other three remained in Poland and perished in the Holocaust. Ilanit’s mother also lost much of her immediate family, with the exception of one brother who survived Auschwitz. Her family’s losses during the Holocaust weighed on her when a German record company offered Ilan and Ilanit a recording contract. Today, Ilanit – who, in addition to Hebrew and English, also speaks Portuguese, Spanish, French, and some German – lives with her husband of 27 years in Kfar Shmaryahu and is active in social causes. For example, during the summer war, Kfar Shmaryahu hosted 100 northern families, for whom Ilanit and other residents bought groceries and other necessities. Ilanit has also lent her name and voice to public service announcements for the Israeli Foundation for Osteoporosis and Bone Diseases, and in 2000, she recorded the song Bone Of My Own for the organization. Upon hearing Bone Of My Own, the Switzerland-based International Osteoporosis Foundation made it the official song of World Osteoporosis Day in October 2000. See all talkbacks "Ilanit looks back"